April in New York means hockey playoffs, basketball playoffs, and preparation for which disappointing quarterback will be joining the New York Jets shortly…yet, no one really cares about any of that right now. It’s Subway Series time, and for the first time in a long time, this series actually means something; both teams are contenders out of the gate, and the title of New York is on the line again. This isn’t a series just for pride anymore, and after a silly attempt at putting the Subway Series all in one week over the past two years (it was not a good idea, despite what some fans will tell you), there’s legitimate excitement all around the Big Apple. It’s hard to believe, but 2015 marks the 18th year of the regular season Subway Series; this matchup, in fact, kicked off ten days (June 16th, 1997) after I was born, and it started with the Yankees’ dominant offense being shutout. So, some things haven’t changed it seems. In the past 18 years, we’ve had some fantastic moments from the Subway Series, but which were the absolute best? Well, that’s what we’re here to count down. Whether it be regular season or from the World Series, a game in the Bronx or a game in Flushing, anything from the past 18 years is eligible for this list. Without further waiting, let’s take a look at what I believe to be the top moments from the Subway Series in the past two decades. Nine earned runs, three innings, and a 15-0 loss…no, that’s not the statline of your MLB 15: The Show created player. Rather, that was the statline of Mets ace Johan Santana on June 14, 2009, in a blowout loss to the New York Yankees. For fans on both sides, this was an extremely memorable series, as we’ll see below, but this was the finishing touch; Santana was lit up badly by the Yankees, including giving up a two-run home run to Yankees outfielder Hideki Matsui, and his ERA went from 2.39 to 3.29 in the process. Not at all a good start from the two-time Cy Young winner, that’s for sure. Do you remember Koo Dae-Sung? I didn’t really remember him, but all of the memories came back when I saw what he did in May 2005. Facing Yankees ‘ace’ (don’t let anyone fool you, Mike Mussina was the true ace of those teams) but still extremely intimidating Randy Johnson, the 35 year old Koo hit a double and then scored on a sacrifice bunt. The last time Koo had hit before facing Johnson, according to the left-hander, was in high school. What a legendary moment from a player that appeared in only 33 games during his illustrious MLB career. It’s not much of a memorable moment to some, but the five solid innings by Yankee starter Dwight ‘Doc’ Gooden in July 2000 make this list for one reason only: it was the first time Doc Gooden had pitched at Shea Stadium since he was with the Mets. Gooden, who had pitched for both Houston and Tampa before coming back to New York, went five innings while allowing two runs in a 4-2 Bombers win. It wasn’t a perfect start, but it was definitely an emotional one and Doc got his team the win. 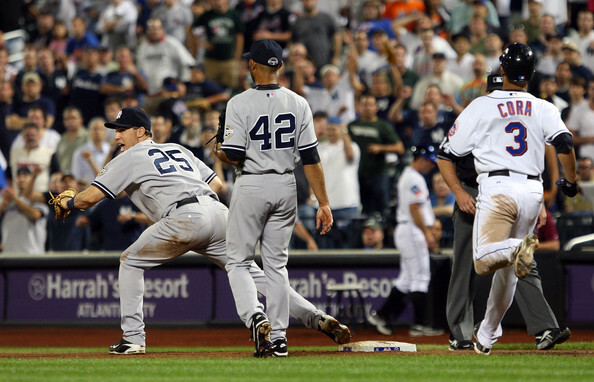 Ah, it’s hard to forget this signature moment of the 2006 Miracle Mets season. In only his second year starting at third, Mets star David Wright hit a walk off single against Rivera to give his team a 7-6 victory. It wasn’t quite David versus Goliath, but it surely was a bright moment in the then-young career of Sir Wright. Ah, one of baseball’s premier rivalries that featured blood and guts galore…well, just blood, though I’m sure Mets catcher Mike Piazza would have loved to rip out Roger Clemens’ guts like a zombie from The Walking Dead (sorry, brother). Anyways, we should all know the story by now: Clemens domed Piazza in the summer of 2000, then there was the whole bat incident in the World Series, Piazza goes deep against Clemens in 2002, and then the beef kind of lost its relevancy. Seeing as some of you probably got very excited when you heard the word blood, here’s the aforementioned bat incident. With all of the great names on the old Mets and Yankee teams — Roger Clemens, Andy Pettite, Al Leiter, David Wells, Rick Reed — you’d think that the first pitcher to throw a shutout in the Subway Series would be a premier name, right? Well, it was veteran Dave Mlicki who threw that first shutout, he of the 8-12, 4.00 ERA season in 1997. In fact, Mlicki did it in the Subway Series’ first ever game, shutting down the Yankees by a final score of 6-0. Thirteen years after his first save, Yankees closer Mariano Rivera joined the 500 save club with a four out closing of the New York Mets. Like most of Rivera’s other outings, the opposing hitters were fooled by the cutter, as Sandman struck out two and forced Alex Cora into a game-ending groundout. Not bad, old man. June 2008 is going to be remembered by every Met fan for what was, essentially, the beginning of the end. It’s a time where Mets manager and former New York Yankee Willie Randolph was fired and Jerry Manuel was named his replacement, a move that began a streak of mediocrity and inconsistency…but, June 2008 was also a time where Carlos Delgado, the oft-criticized Mets first baseman, finally began to show why the team had so much faith in him as their veteran leader. In the first game of a double header in the Bronx, Delgado recorded two home runs nine RBI in the Mets’ 15-6 rout of their crosstown rivals. Michael Kay said it best…A-Rod becomes the hero with a pop up.